THE WORST NUCLEAR accident in history happened on Saturday 26 April 1986 when a Soviet nuclear reactor exploded at Chernobyl. It took almost a week for the radioactive material to drift across Europe and come down in rain showers on Irish soil. The first indication of radioactivity came on Friday 2 May when Met Éireann’s headquarters in Glasnevin recorded a sudden spike in radioactivity over Dublin. 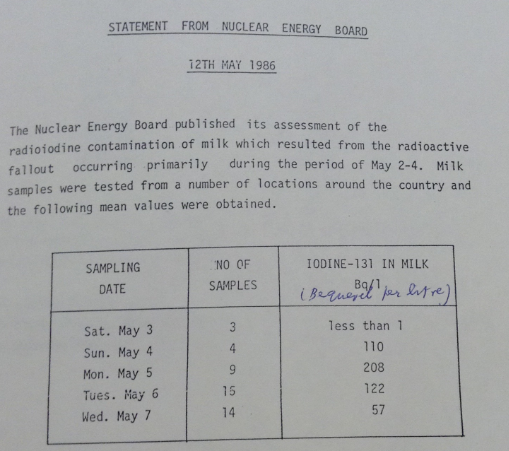 The Nuclear Energy Board, which later became the RPII, began monitoring milk on Saturday 3 May. The most significant elements were iodine 131, caesium 134 and caesium 137. The results of these tests were seen by TheJournal.ie in State Papers for 1986. The tests were measured by becquerels per litre. On 12 May, the Nuclear Energy Board noted that “the levels decreased sharply during the period and the board confirmed that the current indications are that this decrease is continuing. The levels of radioiodine observed in milk in Ireland are notably lower than the levels of 1000-17000 Bq/l found in some regions in Europe. In a statement on Friday 16 May, it stated that average levels of 18 becquerels per litre were obtained on 13 May and emphasised that people should not be concerned about drinking milk or eating dairy products. Vegetables, dairy and other foodstuffs imported into Ireland were also tested. The Nuclear Energy Board set limits for radioiodine of 250 becquerels per kilogram for dairy produce and 175 becquerels per kilogram for fruit and vegetables. Arrangements were also put in place to impound any produce which showed unacceptable levels of contamination. Irish-grown vegetables were also monitored. A statement from the Nuclear Emergency Board from 16 May 1986 stated, “Analysis carried out on a variety of vegetable types from locations around Ireland has shown that levels are all very low and well within the adopted limit”. For the period to the 15 May, levels of iodine-131 ranged from 15-81 becquerels per kilogram on cabbage, 24-146 on lettuce and 14-34 on rhubarb. The levels on leeks dropped from 54 to 24 on washing and samples of scallions, cauliflower and broccoli were measured at 15, 40 and 24 becquerels per kilogram respectively. Much of the contamination was the result of heavy rain, which washed radioactive material out of the atmosphere and into the soil. Speaking to TheJournal.ie, Ciara McMahon, programme manager at the EPA’s Office of Radiological Protection said, “The highest levels of radioactive particles found roughly matches the pattern of rainfall in Ireland at that time” citing areas such as Galway, Mayo, Sligo, and Waterford. The plume dissipated around 5 May, when a westerly wind from the Atlantic turned the cloud back towards Europe. During sampling period, just one item exceeded the guidelines for maximum amount of radioactive material that foodstuffs could contain. Chernobyl resulted in a roughly 3% increase in radiation exposure to the average Irish person in the 12 months following the accident, equating to the same as what you would receive in a matter of minutes during a chest x-ray. Email “1986: The levels of radioactive material in Irish water, milk and vegetables following Chernobyl ”. Feedback on “1986: The levels of radioactive material in Irish water, milk and vegetables following Chernobyl ”.